While Steven Stamkos and Victor Hedman stole all the headlines, one of the big "gets" for the Tampa Bay Lightning this offseason was assistant coach Todd Richards. Richards, the former head coach of both the Minnesota Wild and Columbus Blue Jackets, has been the man in charge of what can only be described as a resurgent Lightning power play. Analyzing a team like the Lightning can sometimes be a little bit difficult, simply because talent can mask a lot of process issues. Simply put, few teams in the league have had the ability to send out a power play unit that includes some combination of talent like Steven Stamkos, Nikita Kucherov, Victor Hedman, Ondrej Palat, etc. over the past few seasons. That type of talent can hide a truly horrendous process. Case in point: The Lightning's man-advantage unit was ranked 14th in the league with an 18.4% conversion rate in 2014-15, despite looking absolutely horrible whenever it was out on the ice. Eventually, luck (read: shooting percentages) dry up and process warts start to show themselves. That's what happened last year, as the Lightning finished 2015-16 with the 28th (!) ranked power play per NHL.com. When talent stops masking process weaknesses, things can get pretty ugly. And that's what makes Todd Richards' impact to date so important. It's true that the Lightning are now rocking along with a 24.4% conversion rate on the power play, good enough for fifth overall in the league. But, as the aforementioned seasons show, power play percentages ebb and flow. Process is what matters. Process is what sets a team up for sustainable and predictable success. As of today, Todd Richards' power play process is working. The chart included above measures the team's shot attempts per 60 minutes of five-on-four action. 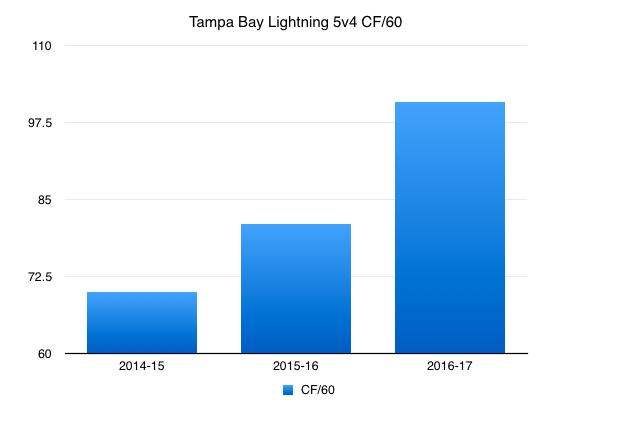 Compared to 2014-15, the Lightning are attempting an additional 30 shots per 60 minutes of ice time; it represents a move from 29th overall to 8th overall in that metric category. To put things in perspective, it's the equivalent of attempting an additional shot on every two-minute man advantage. When guys like Stamkos and Kucherov are the ones making those attempts, dividends are going to start flowing. 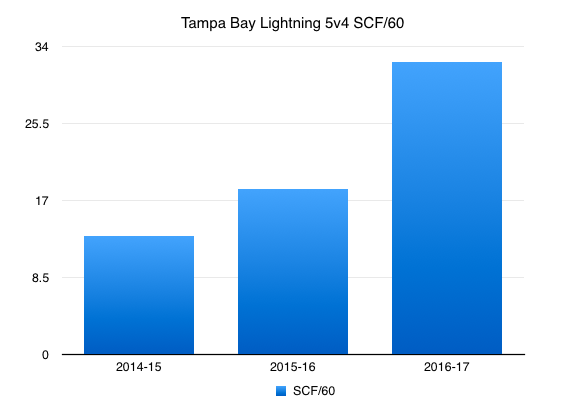 The impact of Richards is equally noticeable: Compared to 2014-15, the Lightning have nearly tripled (!!!) the number of scoring chances they are getting per 60 minutes of PP time. It's an unfathomable improvement. These process changes are reflecting themselves in the results. This team was ranked dead last in xGF/60 (expected goals for) at five-on-four in 2014-15 and 27th in 2015-16. They sit 6th to start 2016-17. That doesn't happen by accident. That doesn't happen without some serious changes. If the early returns are any indication, the Lightning are infinitely better off with Todd Richards running the PP show than they were previously. Putting all the fancy stats aside, perhaps the strongest evidence to support the idea that the Bolts have a good power play is that cries to "DECLINE THE PENALTY" no longer show up on my Twitter feed. In conclusion: The on-ice personnel hasn't changed, but the results certainly have. A good chunk of the credit for that should go to good coaching.